If you are looking for something a little different than a traditional ring, or are specifically looking for a Fleur-de-Lis ring, this women's Fleur-de-Lis ring in 14K white gold from Apples of Gold Jewerly will become a favorite in your collection. The 14K white gold ring is all one piece - the band and the Fleur-de-Lis design, which becomes part of the band on the top of the ring. The Fleur-de-Lis, which is commonly known as being associated with the Song of Solomon and the "Lily without thorns," makes a stunning appearance here in this ring. 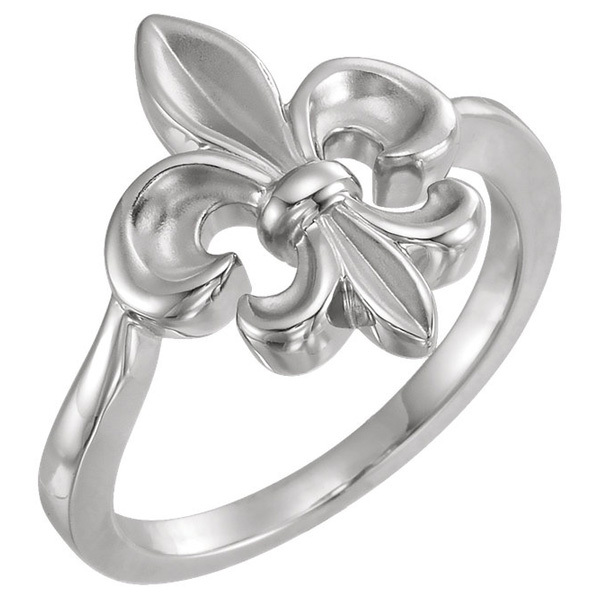 We guarantee our Women's Fleur-de-Lis Ring in 14K White Gold to be high quality, authentic jewelry, as described above.